From high-end showrooms to bargain basements, peruse these shops to help furnish your new place. By Madeline Bilis and Sofia Rivera·	 1/3/2018, 2:46 p.m.
142 Berkeley St., Boston, mgbwhome.com. Who said contemporary interiors couldn’t be ultra-comfy? 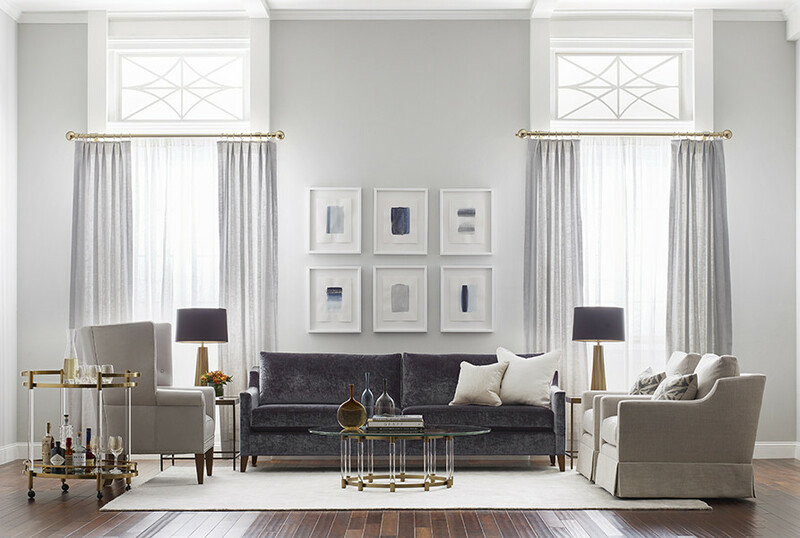 See cozy modern design for yourself in Mitchell Gold + Bob Williams’ Back Bay showroom, where eco-friendly upholstery covers a range of classic and modern sofas, chairs, and other living room staples. 19 Arlington St., Boston, thosmoser.com. 716 Centre St., Jamaica Plain, shopboomerangs. With shops across the city, each Boomerangs location features a different cache of ever-changing goods—but its Jamaica Plain chapter is the best for furniture finds. Conditions range from almost new to well-worn, so bargain seekers will have to take their time browsing—but that’s part of the fun. For those who’d like to clear some clutter before adopting any new pieces, the thrift store offers free pick-up for donations. 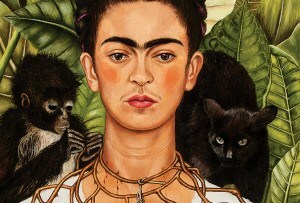 160 Brookline Ave., Boston, westelm.com. There’s a reason we keep coming back to this Brooklyn-based chain: its simple, modern designs are a must-have when it comes to city living. 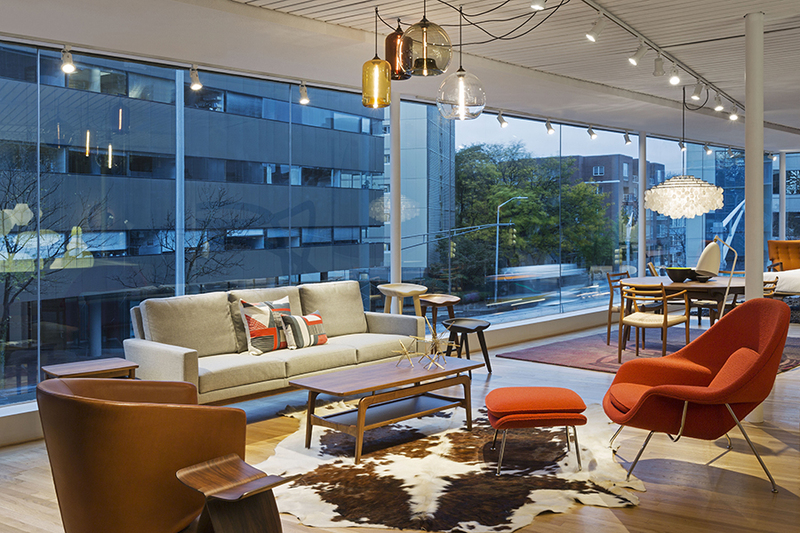 West Elm’s Fenway store offers a huge selection ranging from living room furniture to kitchen accessories, as well as art and products from local makers. 1313 Washington Street, Ste 117, Boston, lekkerhome.com. 15 Channel Center Street #409, Boston, infusionfurniture.com. Woodworker Quentin Kelley handcrafts furniture in his Milton workshop, creating timeless pieces with a modern edge. From shape-shifting tables to classic and colorful stools, each piece blends traditional style with contemporary flair. 31 St. James Ave, Boston; 199 Alewife Brook Parkway, Cambridge, circlefurniture.com. It’s hard not to window shop as you walk by this window-walled store, but you’ll want to step inside to take a closer look at the eclectic mix of pieces that will make your house feel like a home. 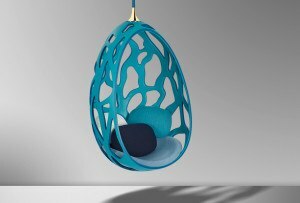 In addition to its eye for sustainability, Circle Furniture is committed to being a local company. Its locations are scattered exclusively across Massachusetts, and much of its furniture is made in New England. 121 Boston St., Boston, machineage.com. Antique flair graces modern silhouettes at this one-of-a-kind Dorchester store, which boasts New England’s largest collection of 20th-century furnishings. Sourced from America and Western Europe, unique finds such as a 1950s driftwood lamp or a hand-painted Italian table are ideal for illuminating or dressing up a living space. 1045 Massachusetts Ave., Cambridge, dwr.com. Design Within Reach was born from the idea that good, modern design should be accessible to everyone. With that in mind, founder Rob Forbes set out to make the creations of designers like Eames, Le Corbusier and Saarinen “within reach” for the everyday shopper. The store’s Cambridge studio is carved out of a modern building Harvard Square, and offers three floors with 32 full-room vignettes, allowing you to envision what the pieces might look like in your space. 75 Arlington Street, Boston, montageweb.com. This upscale furniture gallery features a mélange of European imports from venerable designers like B&B Italia, as well as new brands such as Antoine Proulx, brainchild of Massachusetts native Marc Desplaines. Given the family-run enterprise’s versatility to offer both luxurious comfort and avant-garde designs, you just might be tempted to move in. 380 Washington St., Brighton, europetoday.furniture. This unassuming storefront is home to a range of designs, including vibrant dining room chairs, classical bed frames with intricate scrollwork, neoteric transparent barstools, and compact couches perfect for accommodating small living spaces. 12 Union Park Street, Boston, hudsonboston.com. 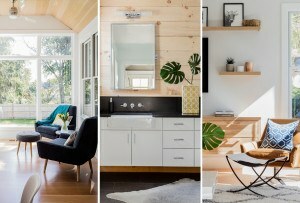 Patternless and grayscale living spaces need look no further for revitalization. Hudson is a beautiful pastiche of design influences, seamlessly marrying the classic with the unexpected. The home goods boutique puts a youthful twist on traditional looks: a chic silver lamp with a tortoise shell base, for example, or an Art Deco-esque side table with a zebra-print top. 375 Newbury St., Boston, roomandboard.com. Take all the time you need to peruse Room & Board’s bright and airy five-floor showroom, which is stocked with more than 90 percent America-made pieces. 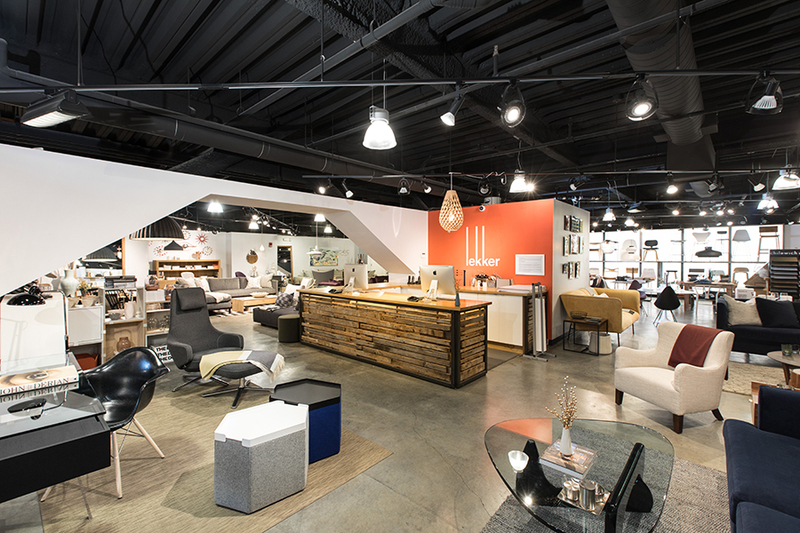 For the methodic shopper, the showroom’s selection, which ranges from classic to midcentury in design, is neatly organized by category and function. 151 Harvard Ave., Allston, basicsboston.com. 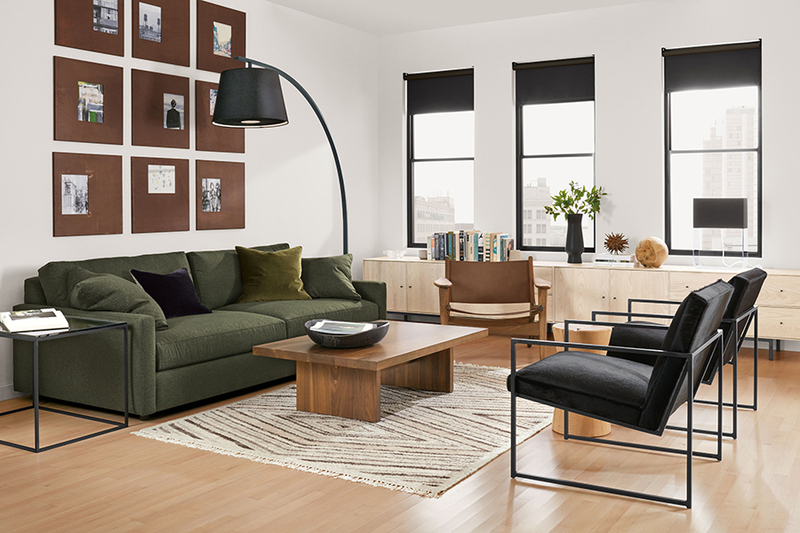 As its name promises, this Allston fixture stocks all the basics, from area rugs and full carpet installation, to comfy sofas and roomy sectionals. Boasting free delivery to Boston and Cambridge customers, Basics is the perfect one-stop-shop for furnishing your first apartment. 419 Boylston St., Boston, pompy.com. Warmth permeates this Back Bay showroom, where a curated selection of the company’s 9,000 total designs are on display. Quality is in Pompy’s DNA, as each piece is carefully crafted out of solid hardwood in the company’s Vermont workshop. 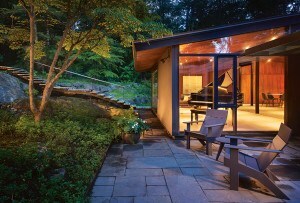 But sturdy doesn’t mean clunky—elegant lines characterize the aesthetic. 234 Berkeley St., Boston, restorationhardware.com. Despite its industrial-sounding name, Restoration Hardware’s palatial Boston flagship overflows with opulence. Board the glass-walled elevator in the atrium to browse pom pom-clad teepees and pint-sized iron apothecary desks in the basement playroom, the fountains and flora in the top-floor conservatory, and the many chandeliers, leather settees, brass accents, and shades of cream, beige, and gray in between. Eclectic finds abound on Sundays at this indoor market, where vendors display new wares each week. 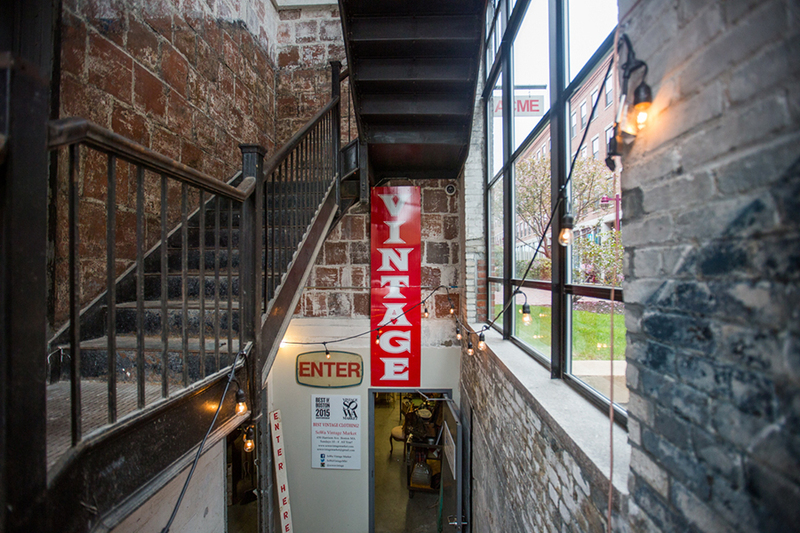 Though not a reliable supplier of couches or kitchen tables, SoWa’s vintage venture is a treasure trove of throwback art, lighting, seating, decor and other objects you’d be hard-pressed to find anywhere else. 2 Avery St., Boston, roche-bobois.com. 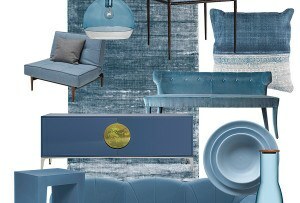 With locations in Downtown Crossing and Natick, the vividly colored Roche Bobois showrooms deliver innovative, boundary-pushing pieces (including Jean Paul Gaultier’s playful chariot-inspired “Ben Hur” armchair with wheels) and patterns from designers such as Cécile Maia Pujol and Kenzo Takada without sacrificing comfort. 200 Boylston St., Boston, ligne-roset.com. Though the brand’s headquarters are nestled in a small city in Eastern France, Ligne Roset’s home in Boston sits right on Boylston Street. The store is an exhibition of contemporary comfort from over 100 designers, replete with high-end monochromatic and two-toned creations, ranging from bedroom furniture to dining room outfits. 201 Msgr. O’Brien Highway, Cambridge, marketantique.com. Treasures abound at the Cambridge Antique Market—if you know where to find them, that is. Arrive with a discerning eye and plenty of patience, then comb through the brick buiding’s multiple floors of baubles. 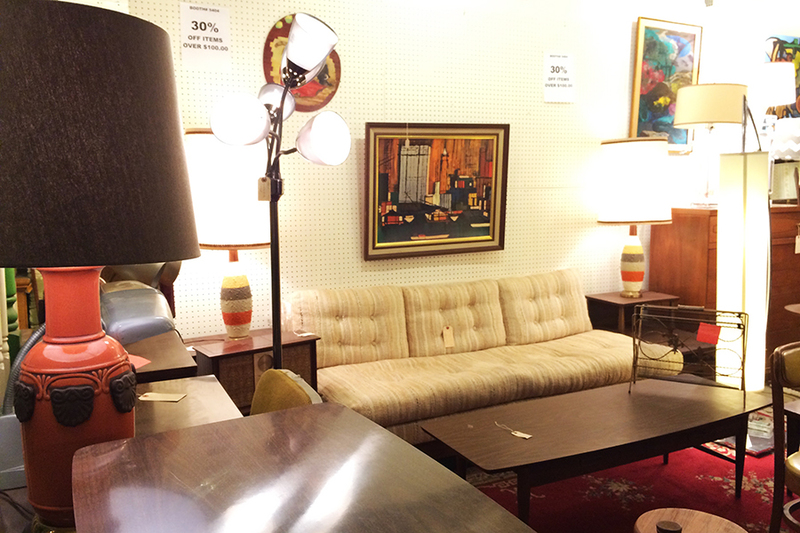 There’s usually a good selection of authentic midcentury modern furniture on the basement level. For midcentury accessories, try the far corner of the top floor. 155 North Beacon Street, Brighton, brighton.cortclearancefurniture.com. Though CORT’s usual trade is rental furniture, its Brighton clearance center offers the opportunity to actually purchase its pieces—at up to 70 percent off the retail price. The inventory represents a range of styles and conditions, from pristine overstock to visibly worn pieces, all of which are marked with a grade indicating their quality. 93 Holland St., Somerville, sunshinesfurniture.com. No need to worry about your friends copying your style when you shop at Sunshine’s Furniture. Each creation is individually refurbished or handcrafted in their Somerville wood shop. From a natural wood bureau with mismatched ceramic knobs to a coat hanger with rustic horseshoe fixtures, the artisan decor will inject any living space with a dose of charisma. The Boston Home team has curated a list of the best home design and home remodeling professionals in Boston, including furniture, home accent décor, and more. Get the help you need with FindIt/Boston's guide to home renovation pros.